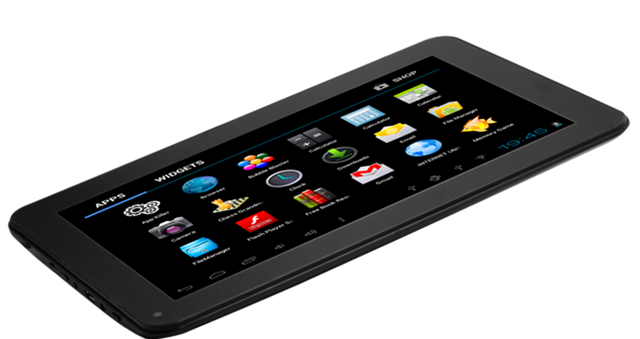 DataWind today launched budget Android Voice tablets in India priced as low as Rs. 3,999. The three tablets launched today include UbiSlate 7Cx, UbiSlate 3G7 and the UbiSlate 9Ci with UbiSlate 7Cx being the cheapest of the three and supports Voice calling. UbiSlate 9Ci has a 9 inch display and will cost you only Rs. 5000. UbiSlate 3G7 features 3G connectivity and is priced at Rs. 6,999. “Despite the recent drop in value of the Indian Rupee, we are committed to bringing affordability in computing and internet access to India’s masses. With this commitment, we’ve held strong and not increased pricing of our products, and instead, now are introducing new products with breakthrough pricing,” said Suneet Singh Tuli, President and CEO of DataWind Ltd.
Ubi Slate 7Cx has a 7 inch TFT LCD display and is powered by 1 GHz Cortex A8 processor assisted by 512 MB RAM and 2 GB internal storage. The operating system employed is Android 4.0 ICS. 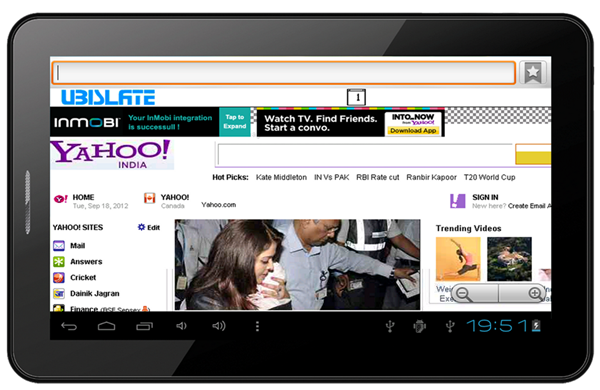 At a price of 3,999 this tab will provide you with good value for money. Some important parameters like Battery backup have not been specified. Ubi Slate 3G7 comes with similar specifications. The processor has a higher clock frequency of 1.2 GHz and internal storage capacity has been increased to 4 GB. You will get a 2 MP camera at the back and a VGA camera on the front for video calling. This tablet supports 3G connectivity and has been priced at Rs. 6,999 which is a little expensive considering the single core processor. Ubi Slate 9Ci has a bigger 9 Inch display and 1 GHz processor based on Cortex A9 architecture this might as well be the only 9 Inch tablet selling at Rs. 4,999. The back camera has been eliminated which makes sense considering the large size and low cost. The display being bigger will also consume more power. DataWind has not specified display resolution of battery capacity for any of these tablets. Most interesting thing about this range of tablets is that they come preloaded with free E-Book App for Class 1 to 12 NCERT in English, Hindi & Urdu Medium, Test Preparation Tool, Free Higher Education and Soft-Skill Courses powered by CEC London, English language learning tools, Interactive Multimedia-rich educational resources, Anti-theft Pack by E-Scan, MapMyIndia Navigation and more. You can order these tablets from DataWind’s Official Website and DataWind promises to deliver these products within 3 to 5 days. I think datawind launched these tablets around 1 year back and never delivered to common public. Now it seems they are launching these tablets again with same specs which are very outdated I wonder who will buy these tablets? No wonder its good for the people who cant afford high end tablets but still it does not make any sense in buying these even though cheaper. Data wind have totally betrayed people,s trust in its earlier dealings..who will buy their stuff now..when more reliable companies have better specs available.